Fifteen-year-old Scott was nervous enough about his trip to Uganda without thinking about magic portals and child soldiers. On an archeological expedition with his dad, Scott finds some mysterious stones in a cave. Despite his better judgment, he pockets the stones, not knowing how grave the consequences will be. Back home in Toronto, Canada, Scott is forced to deal with something worse than arid sands and dry heat — bullies. His longtime nemesis Bruce is cruel and prejudiced, certainly not the kind of person that Scott wants to share any archeological tokens with. But in a twist of fate, Bruce finds the stones and is magically transported to Uganda. There, he learns about Joseph Kony’s horrifying army, made up of kidnapped children. In a daring move, he decides to help these children. But to be able to do this, he’s going to need Scott’s help. Can these two boys cast aside their years of anger toward each other for a greater good? 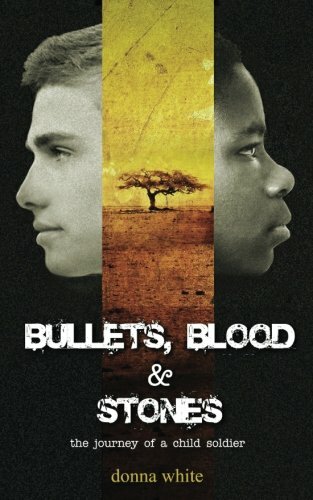 Bullets, Blood, and Stones is an exciting, unexpected novel about one of the most shocking events in the last half-century. Whether you’re well-informed of Kony’s human rights violations or have no idea who he is, author Donna White is ready to take you on an adventure that you’ve never taken before. I was in middle school when Kony hit the news. None of my teachers wanted to talk about it, and the media quickly moved on to other tragedies. Bullets, Blood, and Stones was the first time that I sat down to think about Kony’s horrible actions. Donna White handles this difficult topic with heart and style. The story opens with a terrifying bang. In the prologue, readers can feel the panic of the village as it is raided by another tribe in ancient Africa. This energy transitions well into the first chapter, which skillfully introduces one of the main characters, Scott. His Indiana Jones adventure vibe is fun, and his eye for forensic detail was blessedly accurate, but this light, fun curiosity is tempered with the readers’ knowledge that things will get dark very quickly. Using a magical element was a brilliant move. I had skimmed the summary of Bullets, Blood, and Stones but somehow missed the bit about the magical stones. I was definitely not expecting to see magic incorporated into a serious story about child soldiers, but it turned out to be the perfect plot device. Readers of this book are most likely not child soldiers themselves. While they could certainly sympathize with the plight of boys like Dembe and Charlie, it is easier to relate to the absolute shock and terror of boys who have never been exposed to the violence of Uganda. The violent culture clash that Scott and Bruce experience is a good way for readers to insert themselves into the story. This, I believe, increases interest in the story and empathy for the real-life child soldiers. There was no realistic way to throw Scott and Bruce into the army, so using a magical plot device worked better than a weirdly contrived “feasible” sequence of events. I have no complaints about the characters or the pace of the plot. Every major character felt fleshed-out and realistic; I especially liked how Bruce developed. We’ve all met a schoolyard bully, and while sometimes a redemption arc can seem cheesy, Bruce’s transition from prejudice to compassion was moving. Scott was sufficiently flawed to not be annoying but a truly great person. Charlie was another favorite; I was reminded of Will from Stranger Things. The plot sped along quickly; I didn’t feel like there were any dull moments. To be honest, the first sentence of the novel worried me. Descriptions of rumbling drums and elders’ chants sounded a little generic, and I didn’t want the book to describe Uganda in a generic Toto’s “Africa” kind of way. But my fears were quickly assuaged when I noted the author’s dedication to detailed imagery and accurate character naming. The use of African words, such as kabedo me kuc, jago, and maa, was particularly exciting, since I don’t know a single word outside of English and a few Romance languages. There is a glossary of the Acholi (Luo) words in the back of the book, although White is good at providing enough context that readers don’t have to flip back and forth to find the meaning. The proverbs at the beginning of each chapter were an excellent touch. It helped to set the mood and guide the reader toward understanding the greater themes of the book. I did not recognize most of the proverbs, which was refreshing. The beautiful sayings from Morocco, Guinea, Ethiopia, and other non-Western countries fit perfectly with the story. Standard American proverbs would have felt whitewashed, so I appreciated the author’s effort to further incorporate different cultures into her story. The Somalian proverb, “If you can’t resolve your problems in peace, you can’t solve war,” was particularly touching and relevant. Bullets, Blood, and Stones is an honest, moving portrayal of the struggles of the children kidnapped for the sake of a perverse army.